Modem stands for MOdulator/DEModulator. A modem is a device used to convert digital signals coming from the computer or any digital device to the analog signals which can be communicated over non-digital devices such as TV cables or telephone lines etc. In reference to gaming, a good modem can reduce the connection latency rate, which in turn ensures faster internet speed for smoother gameplay. Well, there is only one problem. Finding a “Good” modem isn’t an easy job as it seems. That is why for your convenience I have created a list of Best modem for gaming in 2019. After extensive research and spending hours in testing multiple brands, I have shortlisted the top 10 modems for gaming which you can buy right now. Several of these modems are not appropriate for everyone as they do carry a high price tag on them. However, these modems are good enough in terms of performance to make it to our list of the top 10 best modems for gaming in 2019. When you talk about cell phones, the Motorola company is very famous in the tech industry but very less number of people know that Motorola also manufactures high-quality cable modems and one of them is MB8600. The important feature that distinguishes Motorola MB8600 among all the other cable modems out there in the market is its DOCSIS standard. Yes, you heard it right, MB8600 is one of the few cable modems out there on the market which supports DOCSIS 3.1 standard. According to Motorola, MB8600 is approved by Comcast Xfinity and Xfinity X1, Cox, and CableOne. But if your ISP doesn’t provide Gigabit internet coverage in your area then you can use regular DOCSIS 3.0 internet with 32*8 channel streams. I have tested this modem for the maximum speed and the results are more than overwhelming. You can easily get 3.8 Gbps speed in the areas where you have DOCSIS 3.1 internet connection. If I talk about the hardware specifications of MB8600, it has a sporting 3GB of RAM, 128MB /16 of NAND flash memory which in itself is a sweet treat. One of the bigger problem faced by the people in most of the cable modems is the security vulnerability due to intel puma chipset, but thanks to the Broadcom chipset which is an important part of Motorola MB8600. So if someone asks me, What modem has the over-the-top performance for the current internet infrastructure? My answer will be Motorola MB8600. Wait, it’s not over, there is more yet to worth look for in the features of MB8600 cable modem, and it is Active Queue Management or AQM. Active Queue Management supported modems are way better than 32×8 3.0-only cable modems in term of Internet latency. What I am trying to say is, If you have a modem that supports AQM, then it results in faster page loads on the internet and also enhances the gaming experience. 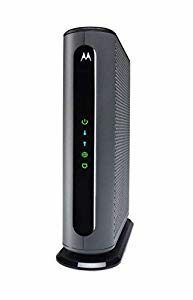 All in all, out of many cable modems which support DOCSIS 3.1 internet connection, the Motorola MB8600 is undoubtedly the best cable modem, especially for gamers right now on the market. Overall, the Motorola MB8600 is an impressive modem that supports the DOCSIS 3.1 Internet connection. Sure, it has some erratic disconnect issues. But considering all the premium features it has, the MB8600 may be one of the best cable modems, especially for gaming in the market right now. 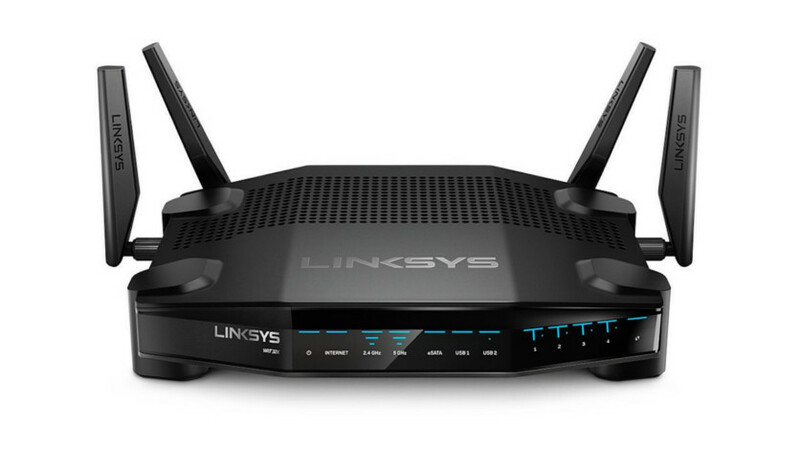 Next on the list is the Linksys CM3016. The chances are that you are already using one of three versions of the Linksys cable modem is very high, as all of them are widely famous in the networking market. But why I have chosen to review only this version out of it’s two more siblings (3008 with 8*4, and 3024 with 24*8 channel configuration)? The reason is very logical – It is because CM3016 version is far cheaper than 3024, and has more powerful capabilities than the 3008. Now without further ado let’s talk about the design of Linksys CM3016. CM3016 shares the same design pattern with all of its sibling models especially the CM3024. It has a black textured surface combined with the rectangular shape. You will find the LED light showing all the different status such as Power, Send, Receive, Status and Ethernet etc at the front side of the modem. And the ethernet ports are present on the back side similar to the CM3024 design. If you are seeing the LED status light glowing blue, it means you are on a Gigabit connection. And if it is glowing green, it means 10/100 Fast Ethernet connection. Somewhat, the above conditions are similar for the Send indicator, the continuous blinking of green light depicts searching for internet, solid green light says an established internet connection and a blue light is for the multi-channel bonding. OK, now let’s talk about how to setup Linksys CM3016. It doesn’t require a lot to setup CM3016, all you need is a router, an ethernet cable and a stable internet connection from your ISP. I have tested this modem for the maximum speed since it’s 16*4 cable modem, so you can expect 686 Mbps downstream and 131 Mbps upstream speed. Linksys claiming this modem to be compatible with Comcast Xfinity, Cox, Charter Spectrum and Time Warner internet, which is I guess more than enough, but to be on the safer side first ask your ISP before you decide to buy this one. So is this modem perfect? Apart from some minor flaws in the old firmware updates, there is not much to write bad things about this product. My advice to all the people who are looking for a cheap gaming modem is to don’t think much rather just buy this one right now. 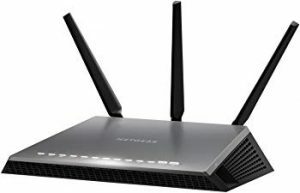 The Netgear D7000 is especially for those who are on a DSL internet connection. So if you are among one of them, then divert all your concentration right here on every word I write about Netgear D7000. The Netgear D700 (DSL modem-router gateway) is more or less have many things in common with the Netgear’s top of the line router, R7000. Just by seeing how it looks, one can easily find out that it is a variant of R7000. It’s look alike sharp and angular edges with the ability to mount on the wall is highly appreciable among the customers. Irrespective of the similarities in design, Netgear D7000 has some differences in hardware features in comparison to R7000. It has two USB 3.0 ports against one in R7000. Also, you will find four ethernet ports on the back side along with a DSL port, a power connector, and internet port. The Netgear D7000 comes with the inbuilt dual-core 1 GHz BCM63138 SoC by Broadcom along with 25 MB RAM and 128 MB memory. As usual, I have tested this modem on its router capability of providing the maximum speed and I was easily getting 1300 Mbps on 5 GHz and 600 Mbps on 2.4 GHz Band. As D7000 belongs to the DSL modem category, it automatically supports both the ADSL+ and VDSL2 technologies. Overall, the Netgear D7000 definitely qualifies as the best modem for gaming that offers a lot for the price you are paying for it. The next product on the list of top gaming modems also comes under the category of the cable modem, It’s Arris Surfboard SB8200. Arris is widely known in the networking field for its 60 years of contribution in connecting the people over the internet. 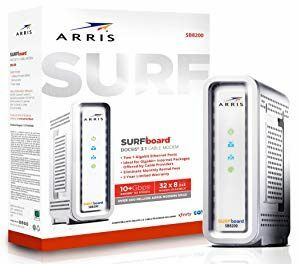 ARRIS SURFboard SB8200 is the latest model of the cable modem launched by the company and its one of the main features is the support for the Docsis 3.1 newest technology supported by ISP just like the Motorola MB8600. 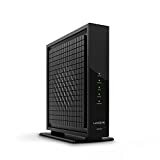 The compatibility with Docsis 3.1 makes this cable modem highly suitable for the operations where high-speed internet is required like streaming 4K HD video and online gaming. SB8200 supports both IPv4 and IPv6 Internet browsing standards and this makes it compatible for almost all the cable network providers in the US. This modem also features 2 Gigabit Ethernet ports which means you can create two individual home networks from just one. To sum it up, the Arris SURFboard SB8200 is definitely a little large and weighty but because of its powerful performance and vast compatibility, it is definitely one of the best modems out there – great for gaming. For those of you who don’t know what are the things that make a modem a good modem to purchase, here are the few things I have mentioned which you can look up to before buying your own modem. You should always check whether the model you have chosen to buy is compatible with your ISP or not. Normally, all the modems are somehow compatible with all the ISPs in the market, but sometimes there can be exceptions as well. So it is advisable to check before you buy. To check whether your modem is compatible with your ISP or not, you would be given a special compatibility chart by your ISP. Here are the ones by Xfinity, Century Link, and Time Warner. If you do not see the compatibility chart of your ISP listed here, then you can call your ISP and ask for it directly. Which version of DOCSIS your ISP supports? DOCSIS stands for Data Over Cable Service Interface Specification. It is the telecommunication standard followed by the ISPs to provide the internet connection to the users. The recent version of telecommunication standard is DOCSIS 3.1 while the other old version is DOCSIS 3.0. In spite of the launch of the new version, still many ISPs do not upgrade to that much high speed to be compatible with DOCSIS 3.1. Some of them may have, but their number is very limited to the high-class cities in the USA. Though there are many good modems in the market that will give you the compatibility of both the DOCSIS 3.0 & DOCSIS 3.1. But if the modem you are purchasing has only the compatibility of DOCSIS 3.1, in that case, you should prefer to ask your ISP once. I am sure there is one more that thing that catches your attention while you were researching about the modems is numbers like 16✕4 or 8✕4. This is nothing just the number of the upstream channels and downstream channels. Considering an example, 8✕4 means that cable modem has 8 downstream channel and 4 upstream channel. In addition to this, one upstream channel can give you the speed of 43mbps. The more this number is huge, the more your cable modem works faster. The topmost configuration among all the cable modems is 32✕8 channel configuration. One thing to keep in notice here is, how fast your cable modem is, the final speed you will get totally depends on the internet plan you are using. Most of the cable modems in the market are somehow having the same number of ethernet ports which is 4. So it’s not something that you should really focus on too much while purchasing your brand new modem. Ethernet port on your modem is basically used to connect Desktop PCs over the internet and if you own a laptop, then you can do this job in a much more easy way by just using a WiFi adapter. As a part of fact, it is always advisable to be on wired connection against wireless to enjoy smooth gaming without the latency issues of a wireless network. Do I have to Use my ISP Modem or My Own Modem? Most of the time your Internet service provider will give you the modem from his side on a monthly rental basis (minimal cost), not sure it could be a router or a 2-in-1 router/modem combo. The money you pay as a monthly rental for the modem provided by your ISP doesn’t seem a lot if you look at it in parts, but if you try to understand by keeping the final price in your mind then you will find out, it actually crosses the amount of actual modem in the market. If you use your ISP owned modem, then you have to be less worry about the compatibility issues over the internet connection. In case of faults, it is the sole duty of the ISP to change the obsolete modem and install the new one without paying extra money. Note: Many Internet service providers include the cost of the modem in your monthly Internet bill whether you use their modem or not. For a normal internet setup, you just require a cable/DSL modem connected with your router. But you will another term in the market which is Modem/Router Combos. So what is Modem/Router Combo and how it is different from separate devices? Basically, many Internet service provider built their own customized router-modem combo device also knowns as gateways. These gateways have their own advantages and disadvantages when it comes to the overall performance of the network. Let’s take a look at the pros and cons of both the configurations Separate devices as well as Modem/Router Combos). In Modem-Router combo, your freedom to change a particular device is gone. Comparably less speed is recorded in this type of setups. The power consumption is less as it just requires a single power outlet. Flexibility in terms of changing particular hardware. Increase in the overall performance of the network. To compensate both devices, you require more space. Will a better Modem/Router improve online gaming? Yes, a better quality modem or a router can improve online gaming as the latency rate is decreased to such an extent. But if the connection from your ISP is not fast, then your online gaming is going to be laggy; that’s a simple fact you cannot deny. I hope this list has somehow helped you in finding the best modem for gaming in your budget. Every modem I picked for this list has something to offer in terms of features, so there’s nothing good or bad. In case you think, I missed out on any good modem, feel free to contact me.